Would you believe it if I told you that less than an hour after our afternoon “snack” at Two Boroughs Larder, The Astronomer and I headed to Hominy Grill for dinner? We roll recklessly on vacation! 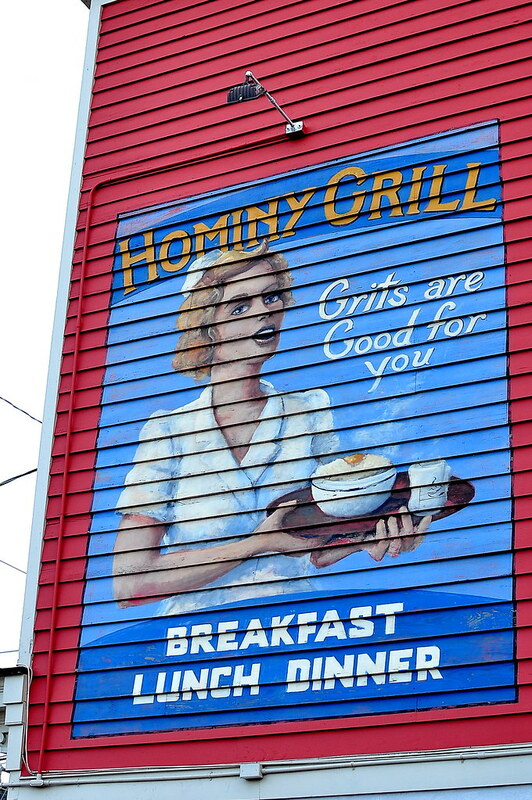 Hominy Grill is a local institution opened in 1996 by Chef Robert Stehling with his wife Nunally Kersh. Named Best Chef Southeast by the James Beard Foundation in 2008, Chef Stehling “lets the Lowcountry’s unique cultural history and flavors guide his cooking,” according to the restaurant’s website. 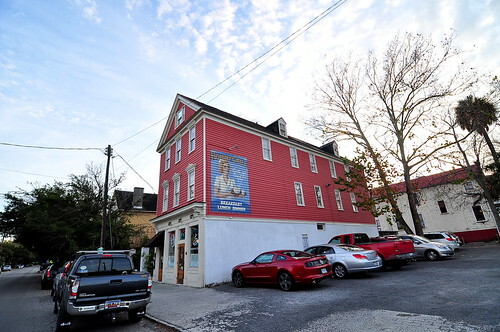 Located in a charming Charleston building from the 1800’s that operated as a barbershop before becoming a restaurant, Hominy Grill is one of the toughest seats to snag in town, especially at breakfast and brunch when reservations aren’t available. The Astronomer’s dad managed to land a table for six at 5 PM, hence our gut-busting back-to-back feasts. 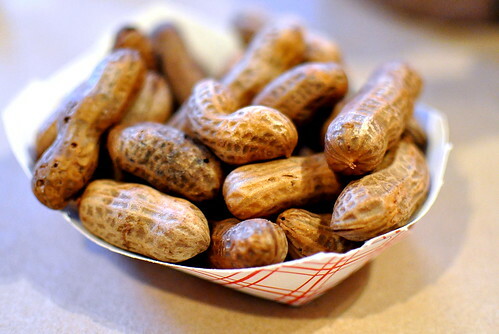 Every meal begins with complimentary boiled peanuts. Soggy nuts, perfectly salted, should not be underestimated. 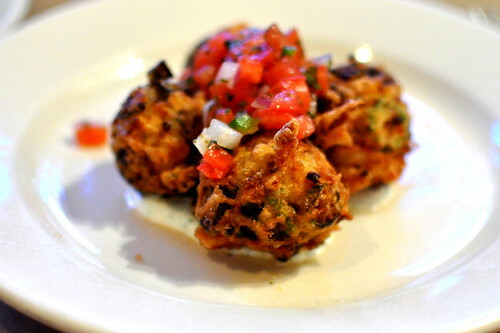 The Astronomer and I shared the “Okra & Shrimp Beignets” with salsa and cilantro-lime sour cream ($8). Crisp-golden on the outside and chock-full of shrimp and okra within, the beignets were quite fabulous. The Mexican-influenced accouterments hit a bright note that really worked with the fried balls o’ goodness. For my main course, the “Shrimp & Grits!” ($18) were calling my name. 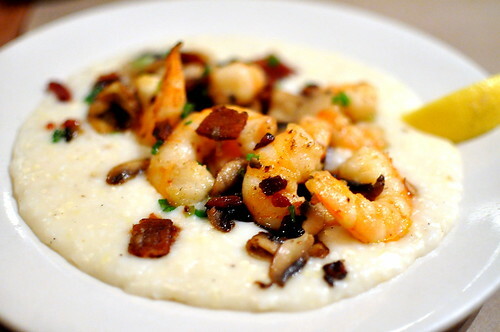 Considered one of Hominy Grill’s signature dishes, the sautéed shrimp with mushrooms, scallions, and bacon served over cheese grits couldn’t be beat. A squeeze of fresh lemon juice livened up the dish just right. A must-order. 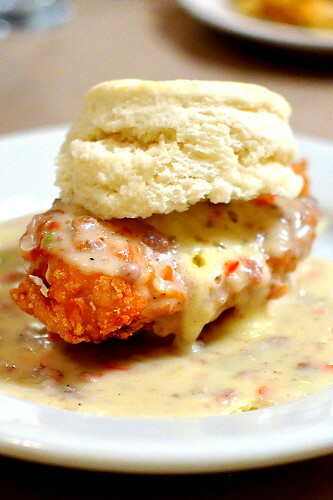 The Astronomer’s “Big Nasty” biscuit with fried chicken breast, cheddar cheese, and sausage gravy ($9.50) was underwhelming due to the pale and doughy biscuit. Had the biscuit been on point, and the chicken moister, this classic combination would’ve really shined. We finished off on a high note with the chocolate pudding, another one of the restaurant’s specialties. 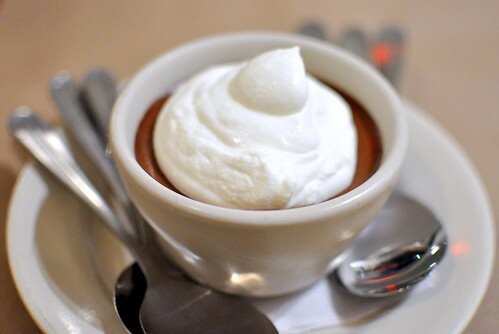 Made with Callebaut dark chocolate and vanilla bean-soaked bourbon and topped with whipped cream, this pudding was dense and intense. It’s rightfully referred to as “The cashmere of chocolate puddings” by Alton Brown. Needless to say, we were very well fed in Charleston.